Leaves are changing colours, the nights are getting cooler and Christmas chocolate is already on the supermarket shelves (yes, really!). Which means it’s nearly ski holiday season. For people with physical disabilities, booking such a holiday can be more of a nightmare than the trip is worth: the flights, the accommodation, the slopes and equipment. It’s a lot of factors to look into. Luckily, Disabled Holidays has arrived to remedy that. As the UK’s largest accessible holiday specialist, the company believes that ski holidays shouldn’t be off limits to those with disabilities. The holiday packages include travel, accessible accommodation, adapted ski hire, qualified adapted ski instructors and insurance, as well as assistance throughout. Trips are offered both within the UK and abroad and include many of the most popular ski locations, including Val Thorens, France. Look to the website’s blog for individual traveler tips on specific spots. Skiing helps build physical and mental strength, as well as confidence, and is great for bonding with friends and family. For those who are interested in trying the sport but don’t know where to start, Disability Snowsport UK (DSUK) is also here to help. The organization strives to make snowsports possible for anybody who has the desire, regardless of their disability. They provide adaptive ski lessons, along with clothing and equipment hire. Lessons can be booked at various locations, including Cairngorm Mountain, Chill Factore in Manchester, Braehead Glasgow and more. Once a person is confident enough to move past lessons, they can join their nearest Local Group through DSUK. These groups are a great way to meet like-minded people and enjoy the sport in a casual setting. For those looking for more competition, there’s the DSUK Race League. 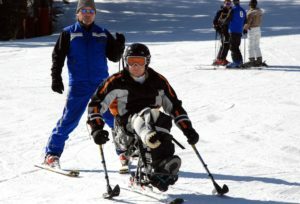 There are various kinds of equipment available for adaptive skiing, from tandemskis, with the pilot riding on the back of the gear, to sitskis, which are great for solo skiers. Ski 2 Freedom Foundation has a wealth of detail on their site to help people choose the best equipment for them. Being out in the mountains, enjoying a sport with others, is always an empowering experience. Fortunately the UK boasts some great resources and networks to make adventures outside in winter accessible to those with various disabilities. So grab a friend, a wooly jumper and hit the slopes.